Laser therapy was formed from scientific research over thirty years ago in Europe. Today, the advanced technology of class-IV deep tissue laser therapy is an effective alternative to surgical procedures, does not require the use of drugs, or have any known side effects. 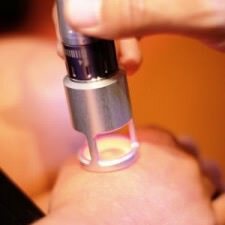 Studies have proven that class-IV laser therapy achieves faster and more results than the treatment from other modalities. Albert Einstein, who brought us the theory of relativity, first proposed the process that makes lasers possible. By the mid nineteen sixties, scientists discovered that lasers could be used to accelerate how fast the body heals after surgery. Since that time, there have been over 2500 medical research papers on the subject of laser therapy, accelerated injury healing, and pain relief. The Class-IV laser provides a deeper penetration that allows for faster treatments with a variety of options and a greater number of applications. This translates into positive physiological outcomes that include: advanced pain relief, Accelerated healing, Increases cellular energy levels, improved range of motion and function, reduction of inflammation and more. During laser therapy, the infrared laser light interacts with tissues at the cellular level. Higher levels of ATP are produced which then increased metabolic activity within the cell, improves the transport of nutrients across the cell membrane and initiates the release of nitric oxide. These events lead to a cascade of beneficial effects increasing cellular function and health. 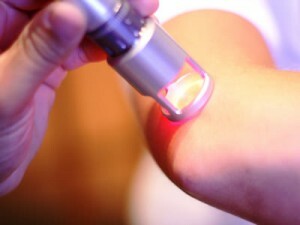 While performing Laser Therapy, the infracted laser light energy interacts with tissue on the cellular level. Metabolic activity increases in the cell which enhances the transportation of nutrients across cell membranes. This triggers the release of nitric oxide which leads to a cascade of beneficial effects increasing cellular function and health. During each painless treatment, laser energy helps with blood flow, drawing water, oxygen, and nutrients into the injured tissue. This creates a optimal therapeutic healing environment that reduces inflammation, swelling, muscle spasms, stiffness and pain. As the injured area returns to normal, function is restored and pain is relieved. During each painless treatment laser energy increases circulation, drawing water, oxygen and nutrients to the damaged area. This creates an optimal healing environment that reduces inflammation, swelling, muscle spasms stiffness and pain. As the injured area returns to normal, function is restored and pain is relieved. The wavelength of light transmitted may be scattered by one type of tissue and greatly absorbed by another. Depending on its components, each type of tissue such as skin, blood vessels, sweat glands, pigment and hair follicles has its own absorption characteristics. As the light is absorbed, photon energy is transformed into biochemical energy increasing cellular activity. The laser’s ability to bio-stimulate tissue growth and repair results in healing tissue. The class-IV laser therapy wavelength is important because the wavelength must be appropriate for proper tissue penetration and proper treatment. The K-laser was the first to employ dual infrared wavelengths simultaneously of 790 nanometers and 970 nanometers. These dual wavelengths are more efficient healing the tissue while also aiding in pain relief. Combining the K-lasers dual frequencies of continuous wave and modulation provides the collimation with the most advanced laser technology. The power settings of the K-laser allow it to be used to treat a variety of injuries and pain. Such as neck, shoulder, back, wrist, knee, foot and ankle, and lower extremities.